Objective:Minimally invasive esophagectomy has been applied wildly for esophageal carcinoma treatment. Thoracoscope-assisted transthoracic esophagectomy(TATTE) and mediastinoscope-assisted transhiatal esophagectomy(MATHE) were two kind of MIE, the objective of this study was to compare these two methods with respect to surgical feasibility and safety. 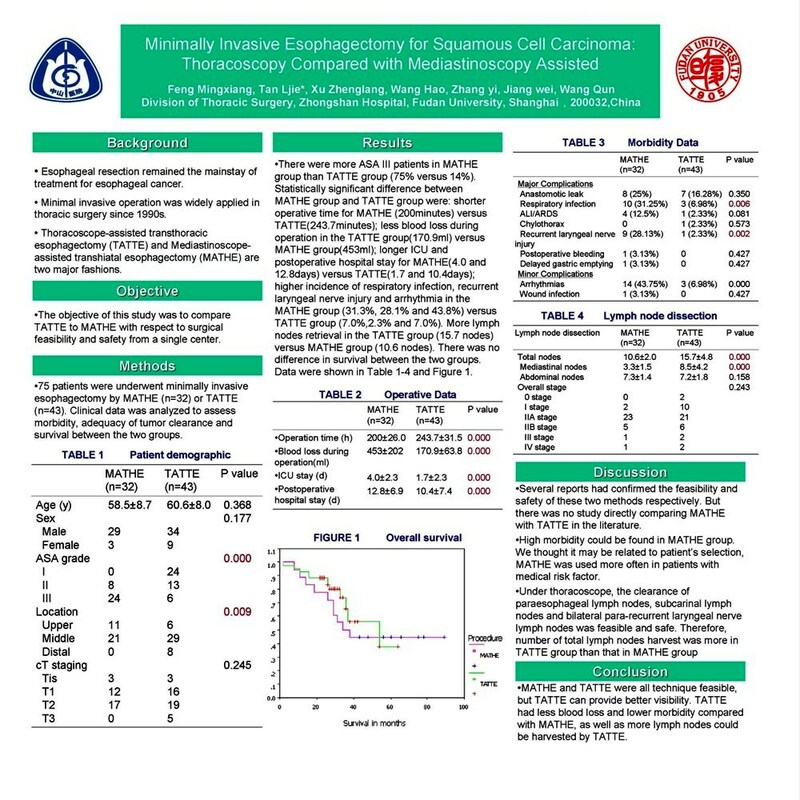 Methods: Single institute experience with MATHE and TATTE was analyzed to assess morbidity, adequacy of tumor clearance and survival. Results: 75 patients underwent minimally invasive esophagectomy by MATHE (n=32) or TATTE(n=43).There was more ASA III patients in MATHE group than TATTE group (75% versus 14%, P<0.01). Statistically significant difference between MATHE group and TATTE group were: shorter operative time for MATHE (200minutes) versus TATTE(243.7minutes); less blood loss during operation in the TATTE group(170.9ml) versus MATHE group(453ml); longer ICU and postoperative hospital stay for MATHE(4.0 and 12.8days) versus TATTE(1.7 and 10.4days); higher incidence of respiratory infection, recurrent laryngeal nerve injury and arrhythmia in the MATHE group (31.3%, 28.1% and 43.8%) versus TATTE group (7.0%,2.3% and 7.0%). More lymph nodes retrieval in the TATTE group(15.7 nodes) versus MATHE(10.6 nodes). There was no difference in survival between MATHE group and TATTE group. Conclusion: MATHE and TATTE were all technique feasible, but TATTE can provide better visibility. TATTE had less blood loss and lower morbidity compared with MATHE. More adequacy tumor clearance with respect to lymph node dissection can be performed with TATTE.